At school, every boy's plastic Pakamac told its own story. No two were every exactly alike, especially when rolled up. Pakamacs...plastic pakamacs...sheer heaven. Have a lovely day! plastic mackintoshes are my favourite. But i also have nylon mackintosh for going out. Unless very warm i wear my mackintosh to go out even when dry. always fully done up and if cold or even chance of rain hood up. I have a kink that a strict person is making me wear my mackintosh. I quite agree Beverly, for I wear my plastic rainwear whenever I can, I like them that much, and always have done, ever since I was a young lad. However, without such long lost manufacturers such as Pakamac – my favourite – and Jiffymac, as well as PlastiMac and others such as Woolworth's used to retail, who flourished in the sixties through to the early eighties, we wouldn’t have the nostalgia we have for them for them today. And I so agree with you Beverly, plastic raincoats - or whatever you may wish to call them - are so nice to wear whenever one can, to get that – oh so good protective feeling – that nothing else can compare with. Here, here, Bev... and let us not forget nylon mackintoshes, too. Couldn't agree more, Beverley mr! One of the main reasons for wearing plastic and nylon macs is for dating like-minded partners. Have a good waterproof day, rain or not! do not know why people think plastic mackintoshes are only for keeping out the rain. They are good for that but for me main purpose is for looking a feeling good. It is only 9.45, and I have worn two plastic macs already. The only thing is, it isn't raining...... Never mind, have a good day, all you waterproof enthusiasts. typing wearing my blue see thru plastic mackintosh nearest i can get to a pakamac. nice area north wales. lots of rain so lots of mackintosh wearing. Not that i need rain i wear my mackintosh most of time regardless of weather. Hello everyone, off to North Wales this weekend, Llandudno, and then the Derbyshire Peak District near Castleton, and given the forecast is for rain, I will certainly be wearing my genuine Pakamac plastic rainwear. So do look out for me if you are in those areas. now wearing my mock leopard skin nylon mackintosh with hood up. For me to pakamc is my first love but where to get one anyone know. So wish i had got a stock pile when they were in fashion. At that time never thought they would disapear and without warning. Lovely, lovely, LOVELY remarks from Plastic Pakamac. wearing my favourite turquios nylon mackintosh this morning. Wearing the hood up. And belt tight. Will be going out soon sun is out but navy mackintosh will be on. It's so nice to hear there are others who really enjoy wearing Pakamac rainwear, but for myself, I so prefer the original genuine Pakamac plastic ones, although nylon ones are quite nice too, for there is something about the original filmy grey men’s plastic raincoats that are just so cosy to wear, and even today I wear mine as often as I can. My first introduction was when I was about ten or eleven years old when my elder brother was given a filmy grey one for school, so I so pestered my mum to get one for me too, which my brother liked as well, and so mum did, even getting one for herself, a pale translucent blue one, as well as one for dad in translucent grey, and I haven’t stopped wearing them ever since, and still do. But I wonder if others wear their Pakamac rainwear in a very special way, for to me it actually feels rather cosy, especially wearing it next to one’s skin. I don’t know why, but it just does, and was always a feature of my progression through puberty to being an adult. And that is why I have what must be a unique collection of Pakamac plastic raincoats from the sixties to the time they stopped producing them in the early nineteen eighties, when the Pakamac Factory at Chadderton was sadly destroyed by fire, ending the English made raincoats forever, so sad, and even more sadly missed. But please do contact me if you have similar memories of wearing Pakamac plastic rainwear so we can share each others memories of such things, for I even write about those times, when plastic rainwear was so very common. It probably wasn't vintage, then, when you bought it. Like yourself I'm always in a nylon mackintosh when on this site. I think, possibly, we all are. I am always wearing a nylon or plastic mac when on this page. at present in rustling cream nylon mackintosh from c & a so guess is vintage. Found in a charity shop few years back. Susan, we are two of a kind. I guess that my comment will not be well received when I say that I hated wearing gabardine raincoats when I was at school. There was always a new one at the start of each school year but they never held any allure for me then and still don't now. The effect on me with my first plastic Pakamac, though, was instant and everlasting. Yes the buttonholes would rip eventually but there was always one with me and I'd pester for more. Then came nylon macs and another unending love for those too. I have never owned as many genuine Pakamacs as I do nowadays. I practically live in them. Those people who know me, know that to be fact. Hello Allan. I have read your post with real interest. Your story mirrors my own, and I feel that we have much in common. I can be contacted on hughdavies957@yahoo.com should you fancy a chat? Thank you for the kind offer. I'll drop you a message over the next couple of days if that's OK. You're right we seem to have lots of similarities!! For as far back as I can remember I have always had a nylon pakamac and from about tye age of 8 I think I realised it was having effect on me not not sure what. As i got older I use to feel very embarrassed about wearing my mac despite numerous other kids wearing the same type of mac....maybe I thought they knew it meant something different to me. Sure enough my Mother was very insistent that I would wear my mac and I use to dread the words "put your mylon mac on before you go anywhere" or "you will be neefing your nylon mac today" I think there was a certain amount of frustration that I had no control over when I wore it and how it affected me. As I headed to early teans I started to be more fascinated as the swishy feeling and how agony on the inside the early nylon macs were. I also started to notice girls wearing similar macs but I would suspect few of my school friends knew I had such a mac as I would often take it off half way to school and put it back on half way home. As you would guess it wasn't long before I was caught out foing that and my Mother would start to check my blazer when I got in to check it was dry and that I had kept my mac on. From my Mothers point of view I would guess she seen it as a challenge, however as I entered got later into my teans I started to get more aroused at wearing a mac but when I was around the age of 14 I was growing quick and my mac was getting small which my Mother had noticed. She then announced she wouls be taking me shopping at the weekend as my mac was too small and she would get mea kagoul. I was struck with horror and immediately said I would rathwr have a nylon mac. She was shocked afterall my years of fighting bit dort of agreed. The big day came and we ended up in the Army and Navy store where she requested a nylon mac for me and the assistant was very helpful and got blue and a grey mac for her too look at. I was instructed to try the navy blue one on which nearly blue my mind but whilst trying it on my Mother picked up a kagoul and suggested that would be better so I practically begged to be kept in a nylon pakamac which waa then bought and I wore thereafter.....still with some guilt. I'm now 56 and wear my nylon Rainmac for dog walking and work and no one really bats an eyelid so I can't see what all the fuss was about !! If I had my time again I think it would have been good to have a nylon mac as my every day school coat and a plastic pakamac for when it rained heavy and my mother shoils have been a lot stricter with me. I wonder if this ring any bells with tesders ? 'Anna' was 'Patricia' from the Mister Polls rainwear forum (except that Patty had a daughter not a son) and occasionally lost her lines early on and signed herself off as 'Patricia' on this blog. Anna/Patricia and her son/daughter are fictional characters....and, as with all grandstanding dominance/control freaks, monumentally uninteresting characters at that. All the stories of Moms making there sons wear macs there used to be a lady called Anna who used to write on this blog complaining about her son who didn't want to wear his mac I would love to know what became of them. Given all the interest in gaberdine mackintoshes maybe there should be a dedicated section on the Historyworld site? Just like the Pakamac there were some very well known manufacturers of school gaberdine mackintoshes including Robert Hirst and Sartor. Similar to the iconiic Pakamac advertisement at the top of this page, there are similar advertisements for the Robert Hirst school mackintoshes which date back to the 1960’s. I estimate that during the 50’s 60’s and 70’s that many thousands of school mackintoshes were produced, I wonder where they all went as they very rarely appear on e bay these days? Please feel free to e mail directly as it seems like we had similar experiences with our gaberdine mackintoshes during our school days. Hello all, love reading about your mums making you wear your gabardine school mackintoshes. Like to hear more.Many years ago when i was at school lot of boys and girls thought it sissy to wear a mackintosh. Seems most that had their mackintoshes on a lot were ones with strict parents that made them wear there mackintoshes. Sadly not in my case . Beverly Mr.
Hi, a friend has just told me about this forum so I thought that I’d add my little bit. Anyone who looks at my nickname will realise that my passion is for the genuine school regulation gaberdine mackintoshes with girls hoods. Although my mother did it me a plastic Mack when I was at school. It didn’t last long as the buttons tore through. I wore a navy blue gaberdine from when I was 4 until I left school at 17. I loved the warmth and security that it gave me. Although I was at boarding school I still wore my gaberdine at every opportunity. There was no one to force me to do it up properly but I always had it fully buttoned and belted and in the senior school I added a girls hood when my mother bought me a new 46” length new gaberdine. I’ve got two now both days interlinked in rubber, 52” long. Hoods of course. I suspect our mother's were very much alike - traditional and no nonsense? It was quite embarrassing to have to wear a pakamac and gaberdine mackintosh in my teens in the mid 80s when all my peers were wearing contemporary coats and jackets. She was overly protective I suppose, and wouldn't accept any disobedience on my part in wearing my macs , but that's a whole different story. Jonathon, it seems like both our mother’s had very similar principals as to how our school gaberdine mackintoshes were to be worn. Like you my mackintosh had to always be correctly belted and buttoned up and i recall that my pakamac was to be worn to keep my mackintosh both dry and clean. My mother did n’t like to see any any stains or splatters of mud on my mackintosh but with my pakamac she did n’t mind as they could be easily wiped off. My sister was the same height as me and on occasions I would borrow her Pakamac as it had a hood and I liked having the hood up on really cold and wet days it kept my head warm and dry and with my mackintosh underneath I felt very snug. I never know why you were considered to be a “sissy” in those days if boys wore hooded mackintoshes or hooded pakamacs as nowadays all anoraks male or female have hoods .i used to envy my sister with her hooded gaberdine mackintosh which I always wanted to but never dared to borrow but I did occasionally try it on at home!. Oh how wonderful to see there are still others who recall their memories of Pakamac Rainwear at school, especially those whose parents insisted upon a strict dress regime, which I too had to adhere to. For my mum always made sure I had my Pakamac with me, wherever I went, even on sunny days, telling me it may rain, or even a summer thunderstorm. Of course I soon got used to that, which I didn’t mind at all, even though I pretended not to like it. For I was rather secretive about wearing my Pakamac, which was always a plastic one, for it had a rather cosy protecting feeling for me. One that has never gone away, hence my collection of Genuine Pakamac Plastic Rainwear. But anyway, it’s so nice to see there are others who feel the same way, be it plastic, nylon, or gabardine. However, I never really liked rubber ones, the aroma was just too offensive for me, but as I said before, each to his or her own. Best wishes to you all, Plastic Pakamac. So interesting to hear from Mactim about his time in school. This resonates heavily with me . My own clothing for both school and outside school included a navy gaberdine mackintosh which my somewhat traditional mother insisted I should wear belted tightly, and buttoned to the neck. Always and with no exceptions. And when it rained heavily or persistently I was always required to wear my full length nylon pakamac buttoned to the neck. My own pakamac was always a couple of inches longer than the gaberdine mackintosh meaning there was no chance for the hem of the gaberdine to get wet or grubby. I well remember even now, almost 35 years later, being marched (yes... marched) to the outfitter at the age of 16 or 17 for a new gaberdine mackintosh and pakamac, when all the other boys were wearing anoraks or cagoules. And having to wear them until well past my 18th birthday. Thank you for your clarification Mactim, and I do now understand, so each to his or her, own. But anyway, I can never forget the soft smoothness of a proper Pakamac plastic raincoat, not the textured sort that so many manufacturers provide, but the genuine Pakamac ones I was brought up with, which will always be my favourites, no matter what else I may wear, as I often do. Whilst gaberdine mackintoshes were the regulation coat to be worn at my school, a pakamac was optional . Unfortunately the gaberdine mackintosh on a walk to or from school on a very wet day was not completely waterproof unlike a Pakamac as you know. The gaberdine could get get a big damp whereas if the Pakamac was correctly done up no rain would get through. The combination of a gaberdine mackintosh and a Pakamac would keep me really warm and still does today as I still like wearing a plastic Mac over either my Burberry gaberdine mackintosh or one of my rubberised mackintoshes. As you know old habits don’t go away! At my school, Manchester Grammar, we never had Gabardine raincoats, but in the mid sixties the preferred school outfitter in central Manchester would include a filmy grey plastic Pakamac in the blazer pocket as part of the uniform. And needless to say, I would wear mine as much as I could. Not everyone wore them, some even discarded them, but I always wore mine, and still do. But, to me anyway, why wear an already waterproof gabardine raincoat under a Pakamac plastic one, perhaps Mactim could help us to understand, for to me anyway,a Pakamac plastic raincoat is far more waterproof than a Gabardine one? However, a Gabardine raincoat was rather more stylish, but I still prefer my genuine Pakamac one. Does anyone remember the days when Pakamac's where worn over your school uniform? I always remember that my sister and ! were made to wear our Pakamcs over our gaberdine school raincoats on rainy days. My Pakamac was longer than my school raincoat ,so that my gaberdine raincoat never got wet . I used to keep my Pakamac was always neatly folded up in my School satchel. PlasticPakamac, your comments are music to the ears. I may well contact you. Best waterproof wishes. In my school days I used to wear my Pakamac, as did some others, but only when they were really needed. But outside of school I’d wear it as much as I could, I even had matching overtrousers, for such things were so very common then, Not true of today though, such a shame. Fortunately I do have a collection of Genuine Pakamac Plastic Raincoats, which I still wear, and I wonder just how many others still do today? Oh, email me above if you wish to reminisce. At school, some of the pupils, who wore plastic macs, referred to them as "their rubber macs", adding to the excitement. Merry Christmas to all pac a mac fans and a happy new year to you all. 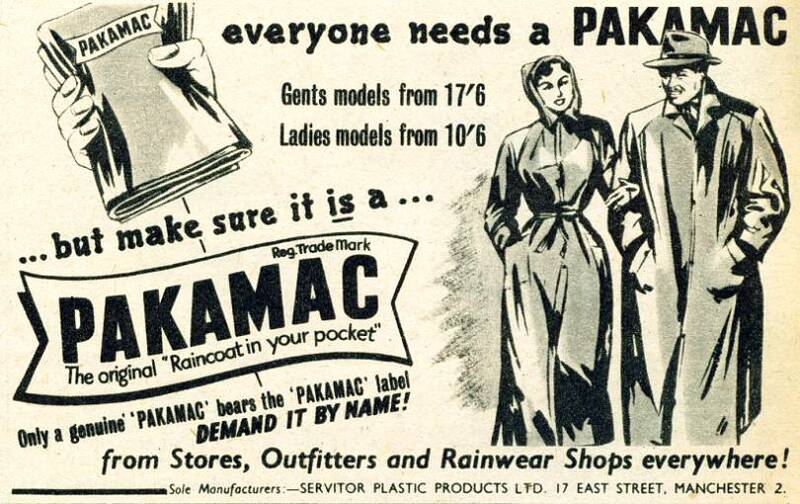 Nice to know there are others who remember the original Pakamac Plastic Raincoats, I even had one as a young teenage boy, and have loved them ever since. But perhaps you could drop me an email to discuss things further. Thanks for your comments Plastic Pakamac. I have used pvculike sometimes, as mentioned by Nicholas Green, but wondered if it was possible to get the old Pakamacs. A longshot I know, and no doubt costly. Hello Alan, lots of nylon and plastic macs on Ebay, worth looking there for Genuine Pakamac Plastic raincoats and things for they occasionally pop up there. However, genuine ones do tend to go for rather high prices. I remember wearing a plastic pakamac in the mid 1960s.Is it still possible to buy a plastic pakamac? I will be publishing my photos soon. Probably sometime in November due to the backlog of unpublished photos, that I have. Hi Brian where can I see photos of your mac? or macs.